The gilets jaunes (yellow vests) movement in France currently has no affiliation with established political parties. As Anne Daguerre explains, this lack of a clear political platform has given rise to debates on the French left over whether the movement should be welcomed as a force for progressive politics or viewed with suspicion as an emanation of the populist right. In mid-November 2018, a hike in diesel prices ignited the gilets jaunes (yellow vests) protests against French president Emmanuel Macron. Macron, once the darling of the European elite, has become the symbol of the arrogance of the French ruling class in the eyes of poor citizens. His fall from grace has been spectacular, even by the standards of a country that usually starts to despise its presidents two years after their election. The protests are now accelerating Macron’s demise. The protests started on the 17th of November 2018. One of the leaders of the movement, 33 year old lorry driver Eric Drouet, called for mass demonstrations in Paris and across France. 285 000 people took to the streets according to official police estimates. The movement was extremely popular at first, with 72% of the French population supporting the protestors. IT workers, retired school teachers, secretaries, small business owners, single mothers and disability benefit recipients, had all had enough of ‘being in the red’. Perhaps just as importantly, they wanted to be heard and seen by the French political elite. They had felt despised and ignored for too long. The diesel tax was the proverbial straw that broke the camels’ back. The movement took the political class and the French media entirely by surprise. Some MPs had tried to warn Emmanuel Macron about growing social anger, but they were either ignored or dismissed by the president’s inner circle. French journalists did not see it coming, either, for they are not used to reporting on peripheral France. Media coverage has traditionally focused on the urban poor, especially young people of immigrant origin concentrated in the suburbs. Provincial people of modest means were not perceived as the dangerous class, so they could be easily forgotten. In this context, the yellow vest is the symbol of the new visibility and relevance of ‘the small people’. On the third of January, a letter issued by Angry France (named after the Facebook group gathering thousands of yellow vests), warned president Macron: “Anger will turn into hatred if you continue, from your pedestal, to consider the small people as beggars, without teeth, people who are nothing”. Some 55,000 took to the streets again on Saturday January 5th, 2019. Although 51% of people still want the movement to continue, public support is dying down, which may well be the beginning of the end for the yellow vests. But the government’s political legitimacy has been severely undermined. The protestors have revealed the fractures of a divided country, and their anger is going nowhere. Whether the great national debate scheduled to start in mid-January can help the country find political unity and purpose through deliberative means remains unclear. A grassroots, anti-tax revolt, the gilets jaunes quickly morphed into a broader anti-establishment movement, with the French president as their main target. They remain an unidentified political object. As such, they have been a headache not only for president Macron, but also for the French Left. Are they an emanation of the populist right, or could they become an insurgent progressive force despite some very troublesome racist, anti-Semitic and homophobic elements amongst them? In simple terms: are they good or bad? In truth, the gilets defy attempts at classification. They have some good, bad and ugly features. Let’s start with the good, from a traditional Left standpoint. On the positive side, the gilets can be seen as embodying the anthem of the French Republic: Liberté, égalité, fraternité. The equality dimension is the clearest. The yellow vests are a popular, working class movement whose members struggle to make ends meets. They protest against fiscal injustice and demand greater redistribution. For the Left, it’s a sure sign that the movement is politically kosher. Then comes the fraternity bit. Well, the gilets have recreated a sense of solidarity and purpose that had been lacking from their lives for years. The ‘small people’ are no longer the ‘potatoes in a sack’ described by Marx in the 18th Brumaire of Louis Napoleon. They have revitalised networks of friendship through a shared experience of collective struggle. As for the third element, liberty, a claim can be made that the demonstrators defend freedom. They have stood for the right to protest, by violent means if necessary, against what they perceive as a fundamentally illegitimate political order. There’s been a great amount of censorship regarding the true scale of police brutality. Demonstrators have been wounded in the face, chest and neck. Some lost an eye or a hand as the result of heavy anti-riot tactics. Intellectuals and left wing groups have denounced president Macron’s endorsement of police violence to advance his neo-liberal agenda. While the French president cannot be compared to General Pinochet, beating people into submission is not a good look for the start up nation. The gilets can thus portray themselves as the champions of resistance to state oppression. This explains why Jean-Luc Mélenchon, the leader of the populist left party La France Insoumise, supports the gilets, clearly hoping to rally them to his cause. But while they embody the generous and equalitarian values endorsed by the populist left, from Podemos to Sanders and Corbyn, there is also a dark side to the movement, which at times can turn plain ugly. Hostility to the press is a trademark of populist (left and right) movements across Europe and the United States. However, hatred of the media is mostly a bad thing from a traditional Left perspective. Russia Today is the movement’s favourite media outlet, which does not inspire great confidence in its liberal credentials. Although the gilets have benefited from relatively favourable media coverage, journalists and columnists have described them as barely literate, seditious factions. A minority has become extremely hostile towards the press, with some demonstrators insulting or attacking journalists. Then there is the violence of the gilets, which has been amply commented on, often in order to discredit the movement. But the ferocity is unmistakable. Anger has spiralled into hatred. 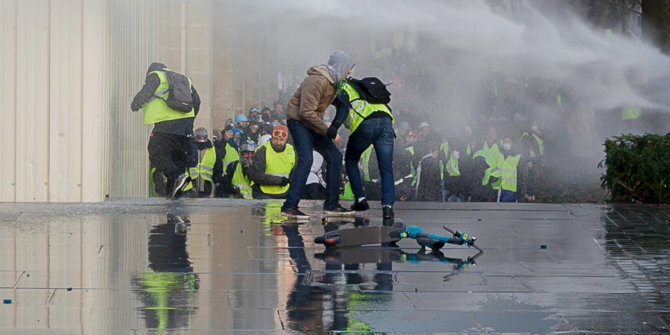 In the streets of Bordeaux, I saw first hand how some demonstrators, armed with batons and projectiles, wanted a physical fight with the police. Protestors burned cars, bins, and shops, leaving a trail of destruction in Paris and some provincial cities. The police, allegedly passive at first, responded in kind. A Lebanese journalist wrote that Paris looked like Beirut. Ultra right and ultra left groups united in their hatred of the French state have infiltrated the rioters. As for the ugly, some demonstrators have held placards castigating Macron as the Rothschild president. The president has been widely portrayed as the champion of the financial system by his opponents. Anti-Semitic placards have been a constant feature of some far-left rallies against Macron. It is not entirely surprising that such slogans should make a reappearance during anti-establishment protests like the ones held by the gilets jaunes, but some demonstrators have taken this even further. On one particularly shocking occasion, protesters have been heard screaming as the police fired teargas: “You are gassing us like Jews!”. These anti-Semitic outbursts have led some socialist MPs and intellectuals to declare once and for all that no respectable left winger could possibly support them. The gilets embody the popular urge to hurl out any leader tainted by elected office and establishment politics. While ‘dégagisme’ can help advance progressive political struggles, as in Latin America in the early 2000s or the mostly ill-fated Arab spring, it can also spectacularly backfire and prompt the rise of the populist right. Which way will the gilets go? Le Pen, or Mélenchon? At present, there is no way to tell. Anne Daguerre is Associate Professor in Work, Welfare and Employment at Middlesex University London. I am a Gilet Jaune, and I can assure you that a very large majority of Gilets Jaunes, no, in any way, fascist or unhealthy tendencies. We simply defend our institutional values of a republic that has lost the meaning of its citizens. We want to find the true values of democracy and human dignity. 2- A revaluation of the purchasing power to live decently. French has always been a revolutionary, but always when the need arose. 3. The French state provides generous social security, good health care and good education..
3. The French state provides good social security benefits, health care and education.. That has to be paid for. A balanced and lucid view of a very confused movement bearing all kinds of mixed features ; anger does not make a coherent program and the absence of political outlet/opening means it will scatter between far left, far right and abstentionnism. What is stricking is the intolerance of a movement believing (wrongly) that it represents “the people”. Thanks for the interesting overview. A balanced and lucid article on a very confused movement bearing all kinds of features (notably intolerance) and believing (wrongly) that it represents “the people”.